The LV277 is a stepped variable low voltage, medium current power supply unit to output a range of AC and DC voltages. It is ideal for many educational and industrial laboratory uses. The power supply’s range for both AC and DC voltages is from 2V to 12V in 2V steps by pre-selection of a bridging link. This is calibrated for nominal input of 240V 50 Hz. The unit will deliver continuously 6 Amps (R.M.S) AC at the nominal voltage of the selected tapping. 6 Amps DC is supplied at lower voltages dependent upon the selected tapping and the voltage drop due to rectification. Both outputs may be used simultaneously at any one selected voltage, provided that the sum of the AC and DC outputs does not exceed 6 Amps (the outputs must not be interconnected externally). The front panel carries calibrated AC and DC output sockets. 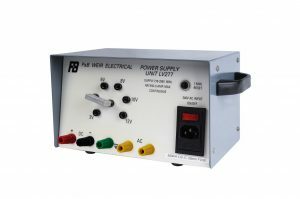 The unit employs a double wound step down transformer with secondary tappings, connected to 4mm sockets mounted into the front panel. These are colour coded Red and Black for DC supply, yellow for AC supply and Green for earth connection .A bridging link is provided to enable the required output voltage to be selected from the appropriately annotated socket. The lightweight rigid construction houses generously rated components comprising: step down low voltage transformer, full wave rectifier and smoothing capacitor. Tamper-proof fasteners are employed throughout. The unit is protected by a one minute delay thermal type circuit breaker with reset button, and a 2 Amp mains fuse, 20mm H.R.C. which can be replaced without removing the cover, mounted in the switch/socket assembly in the front panel. The unit is mounted on rubber feet to facilitate stack storage and has a carrying handle to ease transportation. A cable assembly complying to BS4491.EN60.320 is supplied with a mains plug complying with ASTA BS1363A fitted with a 3 Amp fuse.